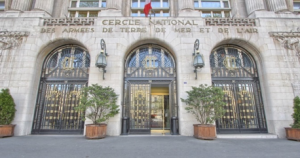 The conference venue, the Cercle National des Armées (CNA), is located at 8 place Saint Augustin, 75008 Paris (see website here). The itineraries by RER from Roissy (Charles de Gaulle) airport can be find here, it is approximately a 1h04 trip. 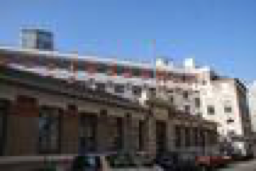 The itineraries from the Orly airport can be find here, it is an approximately 40 minutes trip. 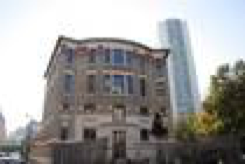 The workshops venue, the ECE school, is located at 10 rue Michel Sextius, 75015 Paris. ECE can be reached by Metro line 6, station Bir Hakeim or RER C, station Champ de Mars- tour Eiffel. 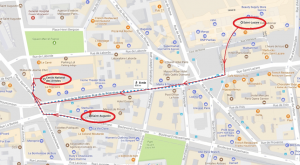 The google map showing how to reach ECE from RER (or Metro) can be found here and a printed map below. Possible itineraries for reaching ECE from the area of the CNA can be found here and it takes approximately 30 minutes. Some rooms will be available for the participants of the conference at CNA (second part of September). Facilities for researchers travelling with family are available, please contact us asap at rtss17-info@inria.fr, cc liliana.cucu@inria.fr. Room rate covers breakfast as well. 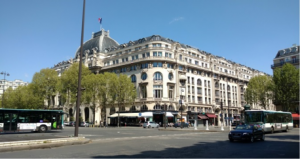 Hotel CERCLE SAINT AUGUSTIN – is the official hotel in the same building as the conference. A limited number of rooms will be available for the conference. The rate for a room is around 150 EUR/night. 9 rue Roy, 75008 Paris. It is situated at 2 minutes walking distance. The rate for a double room for 1 or 2 persons is around 149 EUR/night. WiFi is available and is free of charge. Breakfast is included. 15 Rue de Penthièvre, 75008 Paris. It is situated at 6 minutes walking distance. The rate for a double room for 1 or 2 persons is around 112 EUR/night. The hotel also proposes Family Suites: there are 2 communicating rooms that can accommodate up to 4 people at most, the rate for a family suite is around 265 EUR/night. WiFi is available and is free of charge. Breakfast is included. 29 Rue d’Amsterdam, 75008 Paris. It is situated at 11 minutes walking distance. The rate for a double room for 1 or 2 persons is around 115 EUR/night. WiFi is available and is free of charge. Breakfast is included. 53 rue d’Amsterdam 75008 Paris. It is situated at 12 minutes walking distance. The rate for a room for is between 50 EUR/night a single room without breakfast and 100 EUR/night a double room breakfast included. WiFi is available and is free of charge. Breakfast is included. 4 Rue de l’Isly, 75008 Paris. It is situated at 7 minutes walking distance. The rate for a double room for 1 or 2 persons is around 152 EUR/night. WiFi is available and is free of charge. Breakfast is not included. 18 Rue de Constantinople, 75008 Paris. It is situated at 11 minutes walking distance. The rate for a double room for 1 or 2 persons is around 150 EUR/night. WiFi is available and is free of charge. Breakfast is not included. You may reach Paris by train from European countries. 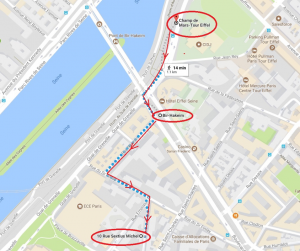 You might arrive at one of several train stations (Gare du Nord, Gare de l’Est, Gare de Lyon) but they are all inside Paris, directly connected to the subway system: see RATP for planning your trip from there. Paris has two airport: Roissy / Charles de Gaulle and Orly. The first one is located North of Paris, the second one South. Either way, you can reach Paris from the airport by taxi, bus or train. There is a third airport at two hours driving distance away from Paris (west of Paris), it is the Beauvais airport. There are shuttles for all the flights, it costs 15,90 € the one way trip, you may find more information here. The Parisian subway and bus network is very reliable and it is operated by RATP. The same tickets work on subway, bus, tramway RER (train network inside of Paris). It costs 1,90€ if bought at the station and 2€ if bought in the bus, and you can use it even for trips including transfers, see more details here. A 10 tickets pack costs 14,90 €.If you stay for the week you may consider to buy a weekly package: it starts on Monday and ends on Sunday, costs 22.80 € and is valid on the whole regional network, Versailles included (you’ll need a photo). The system is standard for occidental countries. Just plan for the likely case where the driver does not speak good enough English. More information, including standard fares, may be found on Aéroport de Paris’ official site, for Charles-de-Gaulle and Orly airports respectively. Vianavigo and RATP (for the Parisien public transportation network) . Uber is well developed in Paris. CityGarden is an application with the parks next to where you are. The French currency is euro (€). Credit cards are commonplace in Paris and ATMs may be found easily. Some stores, bakeries, etc won’t accept cards under 10€. Paris, the capital of France is also considered the capital of the arts, having an enormous cultural patrimony. The most beautiful and famous places to visit are the Louvre museum, the Orsay Museum, the Castel of Versailles and its magnificent gardens, the Casle of Fontainebleau and not less beautiful gardens, the Castle of Vincennes. You may find other tourist information here. You may take a look on Google Arts and Culture, it will surely make you want to visit these places in reality.